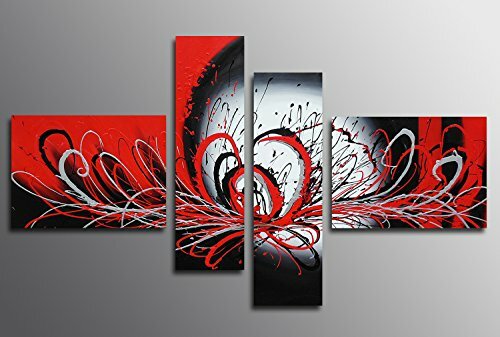 Abstract oil paintings,black and red lines,paint spots,very passionate. A perfect Christmas presents and New Year gifts for your relatives and friends.Can be a good wall decor for living room,kitchen,bedroom,children's room,office,restaurant or public place etc.This painting will light up any room. Size:20x16inx2pcs,10x32inx2pcs(50x40cmx2pcs,25x80cmx2pcs).Stretched,ready to hang,a strong hook is already fixed on the frame and nails are provided,easy to hammer into the wall.